The world is evolving every day and technology is advancing. Everything is moving quicker, but it is more important than ever for the small details to be right and every second to be used to its full potential. Arlyn Scales is proud of the automation systems they offer to customers and the fact that their products help businesses work more efficiently each day. With automated systems, your business can work quicker without you having to worry about receiving accurate readings, and your staff can work on more important tasks. Based in Long Island, New York, Arlyn Scales has been a celebrated leader in the scale industry for over 30 years. We produce high quality scales using the latest technology available and offer a number of automation features in order to fit the requirements of each of our customers. The design and manufacturing of our scales and subassemblies takes place in our factory in Long Island, which allows our company the accessibility required to continuously improve our designs and, in turn, allows us to introduce new features to our customers quickly. Our mission is to surpass expectations when it comes to what our customers look for in scale technology and the value of our products. On all of our scales, we provide a versatile feature called the setpoint controller. The setpoint controller helps your company automate and control the dispensing, filling and batching that takes place. 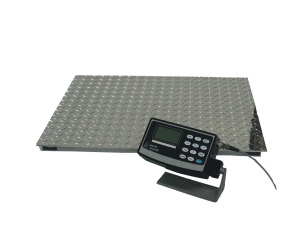 Whether you are interested in a bench scale, platform scale or floor scale, Arlyn Scales has the right scale for you! The setpoint controller is capable of programming up to 8 weight values and can perform automatic filling, programmable logic (PLC) functions, mixing materials and dispensing. Whenever the set weight value is reached, an alarm will go off or an email will notify you that the process is done. The setpoint controller comes in handy when you need to fill up a container with liquids located in a drum. The process requires you to program two different set points—one value near the target weight and the other at the actual target weight. The setpoint controller operates one pump at full speed until the “near target weight” value is reached and then runs a second pump at a slower speed until the actual target weight is met. This process is completely automated and helps the user make the most out of liquid materials. This process can also be reversed if you would like a loss in weight system. To do this, you would enter the lowest target weight instead. The setpoint controller can be used to mix a variety of materials, such as chemical compounds or paint. Without any human involvement necessary, the setpoint controller creates an accurate mixing formula. A weight value needs to be set for each component and every barrel or drum is kept consistent with the others that are not yet mixed. A filling pump from a drum container can be run by the setpoint controller and used to fill containers not located on the scale. Back in the day, people used to have to record weights manually, which, maybe you could guess, allowed for an increased number of mistakes to be made. Immediately or overtime, mistakes would always impact the company’s performance. Luckily for the people of today, we have the advantage of advanced technology and scales can record weight automatically. Arlyn Scales has a lot of experience incorporating our scales into different kinds of settings. And, thanks to advanced technology, all of our scales have multiple digital connectivity options for any kind of automation system. Weight data can be stored in CSV files, which can be easily imported onto any software system. We offer free software that will allow your business to automatically import weight data onto Excel spreadsheets or Access databases. If you would like to keep track of weight data on a flash drive in order to upload the information to your computer later, then that is what we call datalogging and it is definitely an option available to you. Our scales can accommodate a direct connection to a computer, as well. This occurs with the use of a USB port and cable. All you have to do is connect a USB cable between a computer and the scale and then you can use our USB Remote software to store and analyze weight data. The RS-232 option allows for direct connection and scale control to and from a computer. And the RS-485 option is able to network up to 10 scales. Ethernet networks allow computers to communicate with each other from short and long distances. We have incorporated Ethernet and Wi-Fi to support our industrial scales. When our scales are connected to your corporate network, you can control the scale and download the weight data, which can then be analyzed in a variety of applications. If you are connected to the Internet, you can check in on your scale from anywhere in the world. If you have a system in place and Arlyn Scales does not offer an option that meets the requirements of your business, do not worry. We would appreciate speaking with you further about the specifications of what you’re looking for. Arlyn Scales can create a customized option for any customer that needs something different from what we offer and we can promise you that it will integrate into your current system without a problem. If you are interested in automating your business processes, then give us a call today. Feel free to contact our team by phone at 800-645-4301 or access our online contact form here.